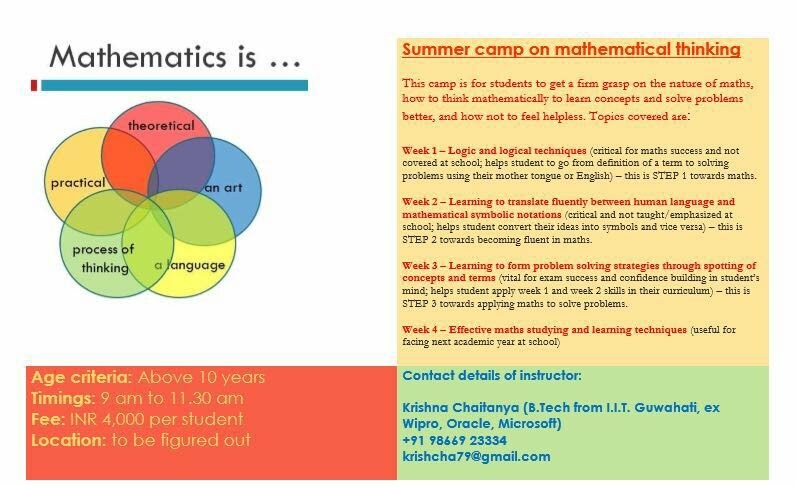 Announcing a Unique Summer Workshop - Mathematical Thinking. Every Summer Camp at Balarcade - Kids say "FUN " Parents say "200% Satisfied"
Do you ever wonder if your school math has a purpose, or do you (secretly) think that it’s just a pointless game of numbers, strange symbols and tips/tricks/methods that you’re supposed to learn and vomit in exams without ever knowing why? If these and related questions bother/interest you or your child, then BALARCADE SUMMER CAMP 2016 is perfect for you. It will introduce mathematical thinking, which is quite distinct from mathematics as you know it, and you will understand why it is smarter to cultivate mathematical thinking rather than to work hard at your math only to forget everything after school closes. With core focus on customized activities and examples for each individual, Kids will get into mathematical thinking through carefully designed interactions and activities. 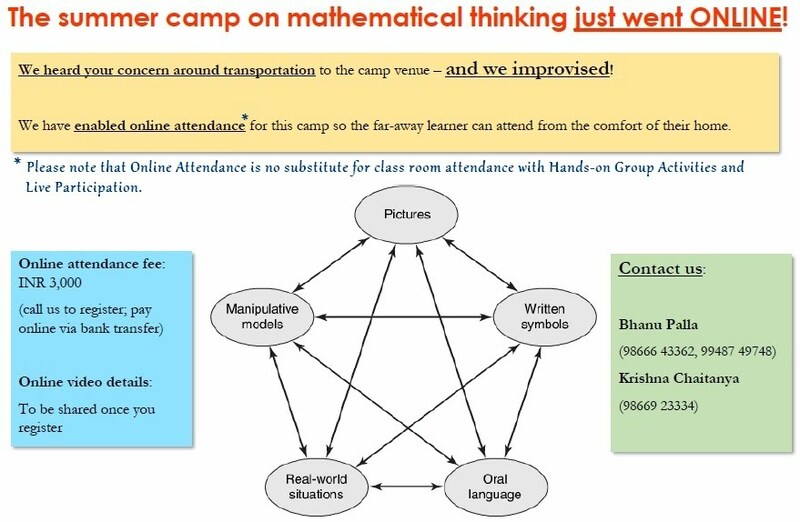 This year Summer Camp with "Mathematical Thinking" at its core, will be ONE-OF-A-KIND, 4-weeks of fun-filled activity based workshop (check out the Weekly Schedule/Topics at the end of this page) to change your kids' perspective on Mathematics. Krishna Chaitanya holds a B.Tech in Mechanical Engineering with special emphasis on mathematics, computational fluid dynamics and programming from I.I.T. Guwahati, and has had a 15-year stint in IT, with a decade of it in a start-up, solving hard problems. He combines this experience with independent, experimental research in mathematical learning and has created a powerful method to learn mathematical thinking and math. He has recently quit the IT industry to bring his method to children to change the way they experience math and lead smarter lives at school and work. With an experienced staff who have conducted various workshops all over the City including the yearly Eenadu Vesavi Sikshana Shibiram. Your Kids will explore aesthetic writing, improving patience, concentration and Hand-Eye Coordination. Timings of the SummerCamp 2016 will be from 9:00 AM - 12:30 PM.